What is THE REVOLUTION OF LOVE? THE MOMENT: In November 2009, I had a moment of inspiration while attending the annual School of the Americas vigil led by Fr. Roy Bourgeois at Fort Benning Georgia. 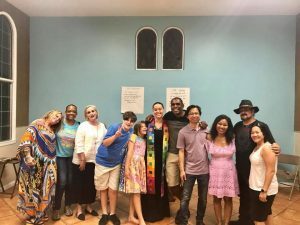 In my mind’s eye I saw a ministry where people-regardless of color, orientation, faith tradition, class, age, gender, ability-could come together. It would be a safe place welcoming everyone. THE FOUNDATION: In Latin the word religion (religare) means “to bind together.” What would bind this new ministry together would be the powerful teachings of nonviolent philosophy. 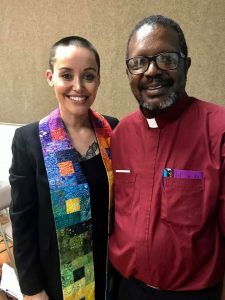 One of my teachers years ago said, I will not be fully nonviolent till 10 minutes after I am dead!” In other words, the learning of nonviolence can be risky and challenging. However, in the end we recognize that nonviolence is actually the path of love. THE PRACTICE: THE REVOLUTION OF LOVE (ROL) is much like a tree made of several branches. There are Saturday night services/talks, a Prayer Rope ministry, The Love Challenge, Nonviolent Trainings, Spiritual Retreats & Workshops, as well as working privately with me for spiritual guidance. Each of these elements offer you spiritual support, education, and enlightenment. At ROL ministry & movement we recognize that you must do the inner work on the self in order to do your prophetic work in the world. WHY IT MATTERS RIGHT NOW: Because you matter. Your life is a singular expression of God. Therefore, there is something you are destined to do that no one else can do like you, and it is imperative that you do it. Second, we are living through historic times. We are being called to radically heal the violent cycles passed down from the generations. We are being called upon to be emissaries of peace and justice. It is through nonviolence, the path of love, that we will be free. Not only will we be free but we will be freedom. The call is yours, the choice up to you. What will you say when you hear the voice within? What will you do when you hear the knock at your door? What will you think upon reading these words? My prayer is that you will respond to this holy charge. This is our moment to rise in Love, with Love, for Love. Let’s do it! 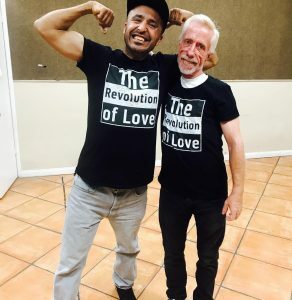 The Revolution of Love is a bold ministry of spiritual renewal and outreach dedicated to peace, transformation, and Love. We embrace people where they are at religiously, spiritually, and welcome those who may be agnostic or atheist. It is a safe place: A place of inclusivity and diversity. A place where we celebrate our similarities and our differences. It also acts as a springboard to inspire and motivate us to change ourselves and the world we live in. At The Revolution of Love we seek to embody our Highest Good. We seek transformation through a heart opening experience; and We claim Our Divine Responsibility and Honor to be change agents of love and peace. We do not enable, cosign, or align, with any form of hatred or violence. and We believe in God with all Its names. No matter who you are, what you look like, where you come from, who you love, we welcome you, we love you. The Time is Now. This is the Revolution!